Quite literally going up in smoke, the evening of the 8th August 2011 found me avoiding the mobs of malcontent cretins who thought that it would be fun to go on a rampage, through the streets of London. Stefanie started the evening, explaining the origin of the Rum Swizzle and the fact that it pre-dated the cocktail bar. Originally made from a combination of rum, sugar, sours and ice whisked together using a “swizzle-stick” from a native plant – the swizzlestick tree, where bits of the bark from the stick would fall into the drink adding a form of bitters. The Rum Swizzle was even said to be the drink of choice at the first recorded cocktail party. The history theme was continued with the origin of El Dorado Rum and its heritage through the centuries old Guyana rum distilleries and its rum productions. Since the first boom of Demerara sugar production in the “Land of Many Waters” the number of rum distilleries slowly reduced until the last remaining four joined together in 1970, to form Demerara Distillers Limited. 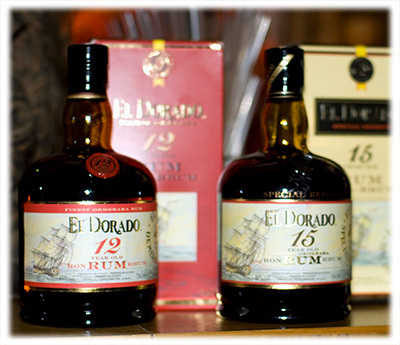 Originally producing bulk rum on behalf of a number of other rum producers, such as Captain Morgan, Lamb’s, Pusser’s, Wood’s and many others, it wasn’t until the 1980’s that the El Dorado brand was launched with their 15 Year Old premium sipping rum. Released to the international market in the 1990’s, to much acclaim, El Dorado 15 Year Old Rum has now won the International Wine and Spirits Competition Rum Trophy an impressive 7 times. Using molasses made from 100% Demerara sugar cane, grown in plantations next to the Demerara River, El Dorado rums are distilled using a number of column and pot stills, including the last remaining wooden Coffey stills and pot stills. 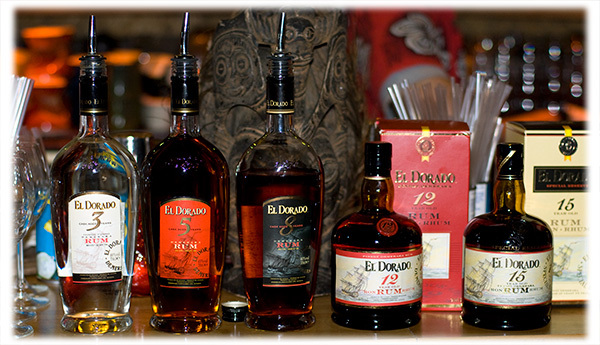 The full range of El Dorado Rum available in the UK consists of El Dorado 3 Year Old, El Dorado 5 Year Old, El Dorado 8 Year Old, El Dorado 12 Year Old, El Dorado 15 Year Old and the El Dorado 21 Year Old. Our evening’s tastings consisted of all but the 21 Year Old, which was unfortunately down to a lack of available bottles. First up was the El Dorado 3 Year Old white rum. With hints of chocolate and nuts, with a creamy smoothness before a slightly spicy afterbite, this white rum is aged for a minimum of 3 years before being charcoal filtered to remove any colour before being bottled at 40% ABV / 80 Proof. This rum was created for the UK cocktail market, for use in drinks such as the Mojito or Daiquiri. Next up was the mainstay of Guyana’s rum drinking population, the El Dorado 5 Year Old golden rum. Aged for a minimum of 5 years and blended with older rums up to 9 years old, this rum is also bottled at 40% ABV / 80 Proof and has a slight pineapple aroma, with a smooth start and a slightly spicy finish. Finishing off El Dorado’s mixing rums, is the premium El Dorado 8 Year Old golden rum, which is as ideally suited to sipping as it is for mixing in a premium cocktail. This 40% ABV / 80 Proof rum is aged for a minimum of 8 years and is a blend of mostly column still rum with a small amount of rum from the pot stills. “This rum” refers to the El Dorado 12 Year Old dark sipping rum and with its smooth, sweet, fruity and complex flavours it really is one of my favourite rums. Mostly blended from wooden pot still rums, this rum is bottled at 40% ABV / 80 Proof and is a minimum of 12 years old. Our last tasting of the evening was the El Dorado 15 Year Old rum, which was originally launched in an attempt to create a premium luxury sipping rum. With the numerous awards that this slightly sweet, spicy and complex rum has won over the years, it is clear that they succeeded. Blended from single pot still rums aged for a minimum of 15 years old, this rum is bottled at a slightly higher strength of 43% ABV / 86 Proof. With the tasting finished and Stefanie’s descriptions of huggable small American oak barrels and height measurements in “Stefanie’s” done for the evening, the Kanaloa bartenders treated us to a selection of cocktails inspired by the El Dorado rums. Of these, my favourite was the El Dorado 12 Year Old Nui Nui-Ni, which along with the rum itself, is just sublime. 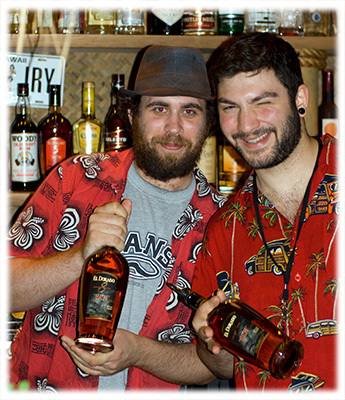 So, as previously my thanks to Stuart, Jamie and the other Kanaloa bartenders for another excellent Kanaloa Rum Club, as well as a huge thank you to El Dorado’s Stefanie for a great presentation and the chance to try so many of their excellent rums in one evening. The next Kanaloa Rum Club should be taking place on Tuesday the 23rd August, where Kanaloa will play host to Ron Diplomático. 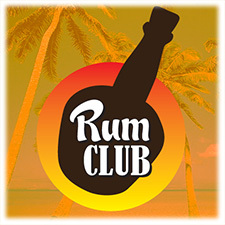 For further details about the Kanaloa Rum club, please email info@kanaloaclub.com or if you’re passing by, simply pop in to Kanaloa Tropical Island Bar & Grill and ask the bar staff.